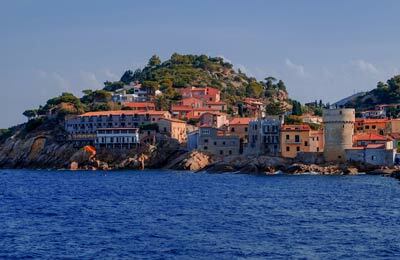 Portoferraio is the capital city of the small historical island of Elba between the North Italian coast and Corsica. You can compare and find the cheapest ferry crossings available from Portoferraio with our easy to use booking form. The ferry companies that work from Portoferraio are Toremar Ferries, Moby Lines and Corsica Sardinia ferries. Below, you can find all the Portoferraio ferry timetables, journey times as well as our best prices. Toremar Ferries, formed in 1976, provide ferries from Portoferraio on Elba to Piombino and Rio Marina on the Italian mainland. Today, it is a very busy operator. In 2009, it carried nearly 2 million passengers onboard its fleet of eight modern and comfortable ships. Onboard you will find air conditioning and escalators and most ferries also provide bars and a shopping arcade. For parents travelling with young children playgrounds are a useful addition to the onboard facilities. Moby Lines ferries provides ferries from Portoferraio on Elba to Piombinon in Italy. Moby Lines Ferries come with a wide range of onboard facilities. All Moby Lines ferries have children's play areas, games rooms and restaurant facilities as well as a range of cabins and seating options. Some Moby Lines ferries also have swimming pools, a la carte restaurants and bars. Corsica Sardinia Ferries are one of the main ferry companies serving the islands of Corsica and Sardinia. From Piombino they go to Bastia in the North East of Corsica. On board a Corsica Sardinia ferry, you will find a range of services and facilities including spacious lounges, bars, restaurants, and shops. Book your ferry to mainland Italy from the beautiful and historic town of Portoferraio on the famous island of Elba simply and securely with AFerry. Portoferraio is the largest settlement on the Italian island of Elba, which is located in the province of Livorno. It is the gateway to the island, connecting Elba to the Italian mainland port of Elba via the port of Piombino. All ferries to and from Portoferraio can be booked with AFerry. Portoferraio has all the basic facilities you should need. 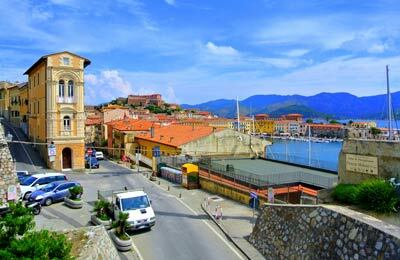 Portoferraio is the largest city on the island of Elba and therefore easy to find from all over the island. Once in the city, the port is well signposted.